The party said Friday’s shutdown was a tribute to a man who killed himself over Sabarimala. But in his dying declaration, he said he hated society. The Bharatiya Janata Party’s opponents in Kerala accused the party of exploiting a man’s suicide for political gain after it organised a shutdown in the state on Friday to “pay homage” to a 49-year-old man who had immolated himself in front of the Secretariat in Thiruvananthapuram the previous day. The BJP’s general secretary MT Ramesh said that Venugopalan Nair had taken his own life because he was hurt that the government was destroying the traditions of the Sabarimala temple. This is a reference to the state government’s attempts to implement the Supreme Court’s verdict in September ruling that women of all ages should be allowed to enter the hilltop shrine in the state’s Pathanamthitta district. Before the judgment, women between the ages of 10 and 50 were prohibited from entering the temple. Several Hindutva groups have organised widespread protests against the verdict. According to the police, Nair doused himself with petrol and set himself on fire at around 1.30 am on Thursday in front of a shed where former BJP leader CK Padmanabhan is staging a hunger strike to highlight his demand for the government to lift the prohibitory orders banning the assembly of more than five people in Sabarimala and nearby areas. The hunger strike entered its 12th day on Friday. Nair was not a member of the BJP nor had he participated in any of the Sabarimala protests. In his dying declaration before a judicial magistrate, Nair said that he had immolated himself because he hated society. The police have registered a case of unnatural death. It said that Nair’s dying declaration, recorded by a judicial magistrate in the presence of doctors at the Government Medical College in Thiruvananthapuram, established that the reason for the suicide was purely personal. In the statement, of which Scroll.in has a copy, Nair said: “I hate this society because of the deeds of the people. I immolated myself. Please don’t disturb me. I don’t have anything to say.” According to the statement, Nair replied in the negative when asked if anyone had forced him to commit suicide or whether he had complaints about anyone. The police also said that Nair had a severe alcohol problem, and that he was drunk when he left his home for the Secretariat. Congress leader Ramesh Chennithala said that the BJP was trying to save face after the failure of its Sabarimala protests. “BJP is putting people in trouble by announcing back-to-back hartals,” he said. He added that in November, the BJP had claimed an Ayyappa devotee named Shivadas as a martyr to the cause. 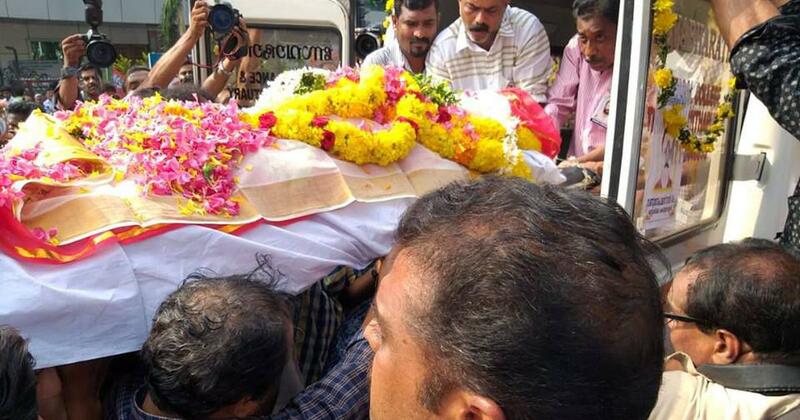 Shivadas’s body was found in a forest in Pathanamthitta district on November 1. The BJP had claimed that Shivadas’s death was the result of police brutality on October 17 at Nilakkal, the entry point to Sabarimala. That day, the police had used force to disperse a mob that attacked women devotees and journalists. The BJP observed a hartal in the district to protest against Shivadas’s death. However, the BJP’s claim was punctured when the police found out that Shivadas had spoken to his relatives on October 19, two days after the police action in which he was supposedly killed. Friday’s shutdown was the sixth hartal called by the BJP since October. The first shutdown was observed in Pathanamthitta district on October 8 to protest against police action on Yuva Morcha activists who had marched to the home of A Padmakumar, the president of the Travancore Devaswom Board, which administers the Sabarimala temple. 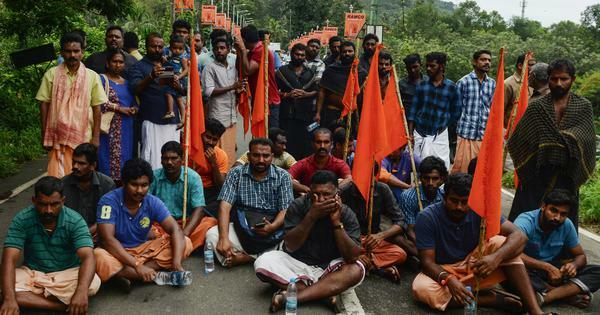 The protesters alleged that the board was taking decisions to violate the customs and traditions at Sabarimala in the wake of the Supreme Court order. A state-wide hartal was called on October 18 against the police action against people who attacked women devotees and journalists at Nilakkal. Pathanamthitta district saw another shutdown on November 2 following the discovery of Shivadas’s body. A state-wide hartal was observed on November 17 after KP Sasikala – leader of the Hindu Aikya Vedi, a constituent of Sangh Parivar – was arrested on her way to Sabarimala. The BJP then organised a hartal in Thiruvananthapuram district on December 12 against the alleged police action against BJP workers who marched to the Secretariat to protest against the state government’s handling of the Sabarimala issue. Hartals are the favoured mode of protest for everyone in Kerala, from political parties and trade unions to people’s collectives and merchant organisations. The reasons for striking vary, from protesting attacks on their members to criticising the government’s policies. This year, the state has witnessed 97 hartals till December 14, according to statistics compiled by the Say No to Hartal movement. The Bharatiya Janata Party called 33 hartals, the Congress-led United Democratic Front organised 27, while the ruling Left Democratic Front accounted for 16. The majority of the hartals were local in nature, said the report.